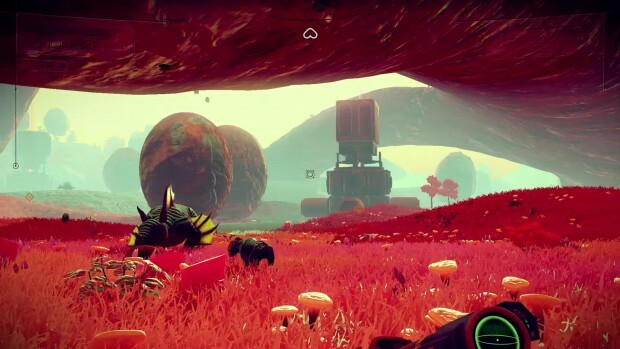 No Mans Sky can only be described as 'Marmite', not in the sense that it's brown nor sticky but because in time, you'll either love it or hate it. 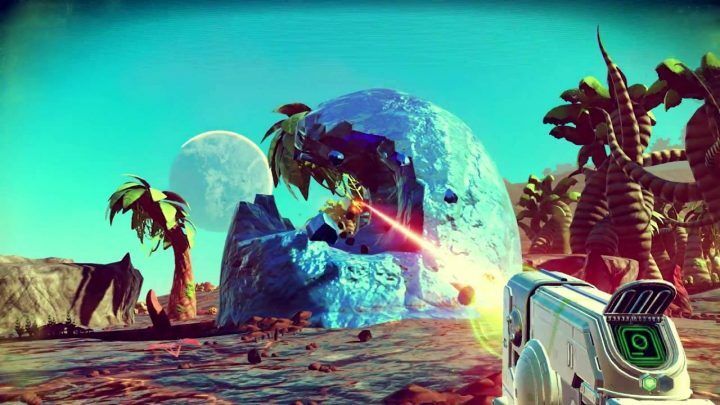 No Man’s Sky has officially landed and considering it’s previous hiccups it seems to be causing quite a stir. Normally I’d form an opinion and write a review upon finishing a game, but considering the sheer size of No Man’s Sky that’s never going to happen, so I’m going with my gut on this one. The basics of the game are quite simple, it’s something that we humans have already been doing for hundreds of years. You discover a place, claim it for your own and then drain it of all its possible resources for personal benefit and survival, whilst taking advantage of the local culture and its inhabitants. The game is based on a backbone of exploration, survival, combat and trading. One of the games biggest features and definitely the most talked about selling point is its sheer size and density, and it whole heartedly delivers on this and deserves a well earned round of applause. The open universe in which the game is set is procedurally generated, meaning the amount of locations available to visit is literally in the quintillions and would take billions of years to do so. The game starts and throws you right in with no explanation or introduction. With little context its difficult to adjust and it’s a bit like fumbling in the dark. There’s no real form of general guidance for the controls and it basically leaves you to figure things out for yourself. Once you find your feet after poking around the starting zone you can finally set off towards the horizon with a basic goal of survival and exploration. Reminiscent of Mass Effect 2‘s planetary resource draining quests mixed with Arthur C Clarke’s Space Odyssey, you set off equipped with some basic tools to start with, including life support, a mining gun and a scanner, which all require constant monitoring and check ups as you wonder. Remember, Carbon is essential to all life and that fact is constantly reinstated throughout the game. The scanner can reveal precious resources and miscellaneous markers across the horizon along with the timed distance to them, which at points can be both helpful and infuriating as something which may look relatively close may be a 40 minute walk away. You start off with little inventory space which can fill up quite easily and gets clogged by artefacts and technology. If like me you hate dropping items this can be expanded on by finding upgrades and traders to buy new ships with more available slots. Alien life forms can be found throughout the universe whose knowledge, trade and guidance help the game to feel a bit more purposeful. By adding ‘flesh’ to what feels like a very empty universe the interaction between species is completely necessary and if anything, could probably have benefited from having a lot more. Although it is basically a giant free for all there is a very general guideline to follow. The Atlas is a universal database which can hold information uploaded by yourself and other players in order to share knowledge and receive credits, it can also advise on what tools and materials are needed to complete the ‘main quest’. I say ‘main quest’ as there is no true final goal as stated by the developers, but the centre of the universe is said to hold a tantalising secret. The gameplay feels glitchy at points and tends to be quite laggy, the characters movement isn’t as smooth as it could be and at points it feels like it’s tripping over its own feet. 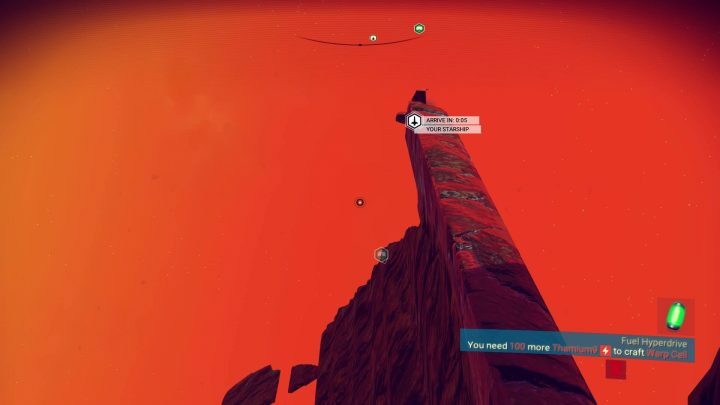 I’ve already heard of a few instances where the games completely crashed and I had one issue in particular where the game bugged and crashed whilst flying the spacecraft, only to reload me at the bottom of a vertical inaccessible mountain with a now broken space craft at the top (which took over 2 hours to get around). A number of previously made promises are already seeming to be troubling the developers due to the sheer volume of interest and the traffic that the game has received since release day. Most notably, how it was originally stated that although it was ‘highly unlikely’ it was not impossible to come across another player throughout the game due to ‘lobbying’. When two players came across each other on the first day of release they found that this was not necessarily the case. The developers have also stated that the game will contain other multiplayer elements, although it shouldn’t be classed as an online multiplayer game due to the sheer size of the universe. 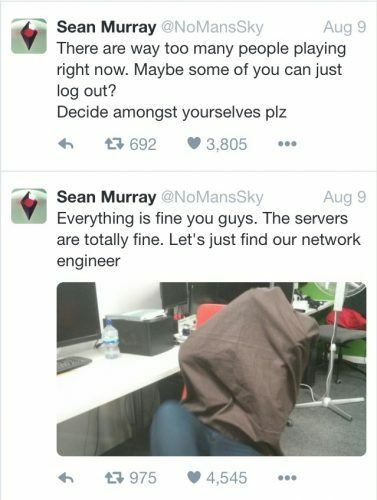 They recently announced via Twitter that it was struggling with the sheer volume of players logging onto their servers and even went as far as asking people to ‘log out’. The game is still new and once the servers die down it has a lot of small and large scale issues that need resolving. At the moment it’s riding on the back of the hype created over it’s procedurally generated Universe which I believe will eventually come to a halt. Despite that, the game is visually appealing and is on a level of it’s own when it comes to ingenuity in an area which can often become saturated. 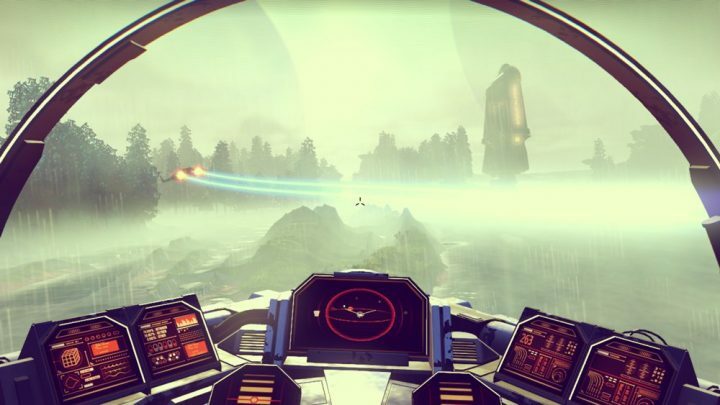 No Man’s Sky can only be described as ‘Marmite’, not in the sense that it’s brown nor sticky but because in time, you’ll either love it or hate it.